Belarusian Journalist Svetlana Alexievich Wins Literature Nobel : The Two-Way The investigative journalist is known for her in-depth exposes of the former Soviet Union, letting eyewitness accounts shed an unsettling light on tragedies. 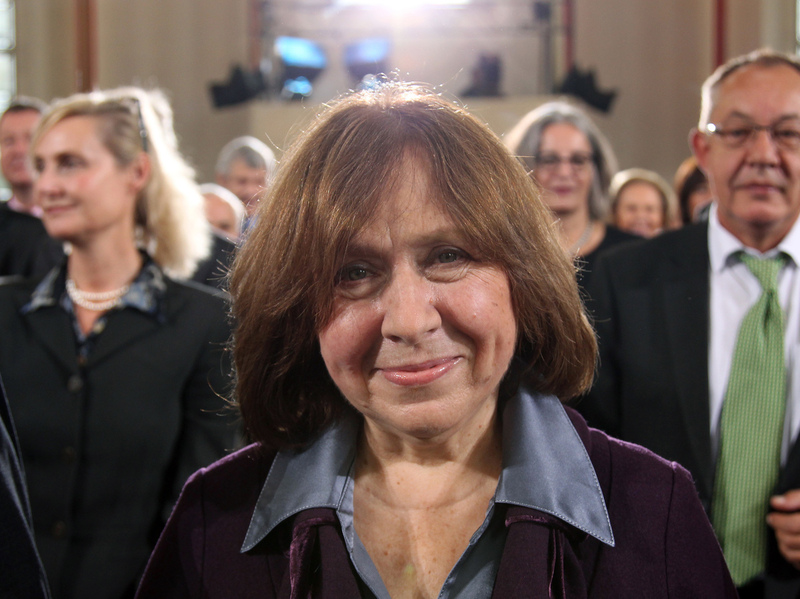 Belarusian journalist Svetlana Alexievich, during the ceremony for the German Book Trade Peace Prize, which she won in 2013. On her personal website, Alexievich explains her pursuit of journalism: "I chose a genre where human voices speak for themselves." Fittingly, Alexievich prefers to leave the stories to her many interviewees, letting eyewitness accounts shed an unsettling light on tragedies like World War II, the Soviet-Afghan War and the disaster at Chernobyl — an investigation that has been read aloud in excerpts on All Things Considered. For that work, Voices from Chernobyl: The Oral History of a Nuclear Disaster, Alexievich interviewed hundreds of people touched by the massive 1986 nuclear meltdown, which spread radioactivity on the wind across much of Eastern Europe. "All of my books consist of witnesses' evidence, people's living voices," she told the Dalkey Archive Press. "I usually spend three to four years writing a book, but this time it took me more than ten years." In an interview following the announcement, the Swedish Academy's permanent secretary, Sara Danius, elaborated on the decision. "For the past 30 or 40 years, she has been busy mapping the Soviet and post-Soviet individual," Danius said. "But it's not really about a history of events; it's about a history of emotions." If you're new to Alexievich's work, Danius added, she recommends beginning with War's Unwomanly Face -- a history the Soviet women who fought as soldiers in the Second World War. It has been quite a long time since a nonfiction writer won the Nobel. Not since the heady days of Bertrand Russell and Winston Churchill, over half a century ago, has an author won for a career of work primarily in nonfiction. Alexievich's prize breaks that long dry spell. The 67-year-old is the 112th writer — and 14th woman — to win the prize. She will receive her medal at a ceremony on Dec. 10. Read excerpts of Voices from Chernobyl. A previous version of this story stated that Alexievich is the 108th writer to win the Nobel Prize in Literature. In fact, it is the 108th prize to be awarded — but, because of instances in which the prize was shared, Alexievich is the 112th winner.